That was second breakfast, after the Corpus Christi mass on the Marienplatz. It was hot today in Munich. What, you expect Christian men to not have a cold beer after standing in the sun for over an hour? We sat outside the Andescher am Dom cafe behind the Frauenkirche with our friends, and drank helles lager and ate the best pretzels imaginable, with mustard. For a late lunch, we went to the biergarten in the Englischer Garten park. That’s my wurst and sauerkraut on the left, and a cold helles lager. Tomorrow, I need to be sure to order pork knuckles, and more Bavarian sausage. I am just the wurst, I tell you. Posted in View From Your Table. Tagged Germany, Munich. Oh how I envy you right now. Have a weissbier for me, with lemon. Your lunch looks so good. I love German food! It all looks wonderful. I love sauerkraut. Enjoy your trip! 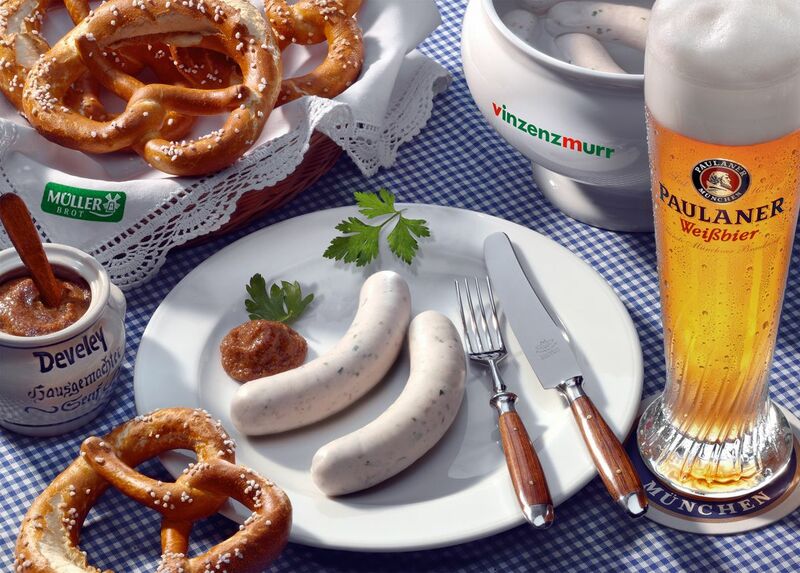 If you are still there, have the Munchener Fruhstuck … Brez’n, Weissbier and Weisswurst. Munich is a lovely place, especially this time of year. I hated mustard until I went to the Austrian Alps and had the real stuff. From a street vendor, no less. Second breakfast? Is this the Shire? Leberknodlen , liver dumpling in broth. Is someone wearing a “Laurus” themed t-shirt? If you’d like a break from German food, you can get a wonderful Italian lunch at Il Grappolo on Adalbertstrasse (near LMU and in a great area). Deine Wurst is mir wurscht. As a German (although with a so-called “migration background”) I would like to welcome you in Europe and Germany. Perhaps you will visit some masses, perhaps some catholic ones. I am living in a typicall West German city, and what I usually see, while I am standing in one of the last rows, is a lot of gray hair. A large percentage of the German visitors are old. But there are also two or three young German families, who come regularly. (In the period before the first communion there are more young families, as the children have to attend mass. But soon after the first communion most of them stop coming.) But then there are migrants. And I can’t stop to think that this is not a bad thing. Our priests are from Poland, they are monks and have a little monastery in our city, and they understand that they have to treat us as the unbelievers that we in many cases are, that they have to be fishers of men, and that it is about faith, not rules. There seems to be an ethnonational crisis in the West, but when I think about the religious crisis I have hope. I see fresh green leaves of grass in an old and beautiful, but very neglected garden. But I understand that one can be pessimistic. I was pessimistic myself. I don’t know if my children will be Catholics when they leave home. I accept all the doubts and questions they express. In the end, it is not about good arguments or ideas, but about faith – and love, as God is love.